At a recent charitable vison clinic in Paraguay, the team saw 3,189 patients in 5 days. But it was the final patient on the last clinic day that made the biggest impression on volunteer Ed Sosa. OneSight’s team of volunteers was tired and the clinic had technically closed, but the line outside remained long with locals that were hoping to be seen despite not having been issued a ticket to attend. So the team decided to reopen the clinic. A young boy was the very last of the extra patients to go through. After the boy received his glasses, his grateful father, Edgar, approached Ed to share his heartfelt thanks that the volunteers had made clear sight possible for his son. Then Edgar surprised Ed by handing him a foldable bottle opener from his pocket. While he didn’t have much money, he said, he wanted to show his appreciation in a tangible way. Though Ed was touched but rushing around taking care of final clinic details. It wasn’t until later that he really understood the sacrifice Edgar was making in handing him the bottle opener. A member of the local Rotary Club told Ed that the bottle opener was something Edgar kept with him at all times. It had belonged to Edgar’s father, and they would use it during their fishing trips together. Since his father had passed away, Edgar kept the opener as a reminder of their relationship. Edgar had left a voicemail with the Rotary Club member so Ed could hear his story for himself. 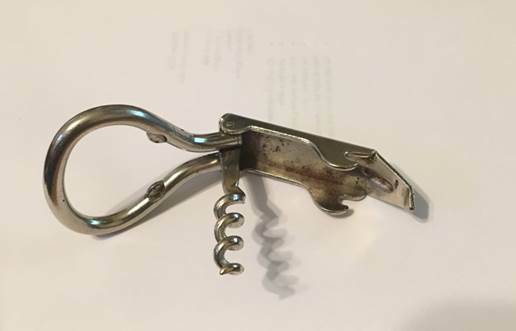 That’s when Ed realized that the rust on the opener wasn’t just a sign of oxidation, but rather etched memories of a father and son. On his return trip from Paraguay, Ed couldn’t help but think about his own sons and what kind of memories he was leaving with them. Now Ed is in back touch with the Rotary Club member, who is helping him re-connect with Edgar. Ed and his family are planning to reach out to get to know more about Edgar’s family and so something special for them as a thank you. Donate today to help families like Edgar’s — $30 provides an eye exam and a pair of glasses to someone in need.